It is a well known fact that cats are among, if not the most, curious animals out there. And once your fluffball is done with exploring every single nook and cranny of your home, it will only be a matter of time before he decides to venture outside. With a bit of help from the skilled specialists at Fantastic Handyman, your beloved pet will be able to enjoy the outdoors at any hour of the day or night! 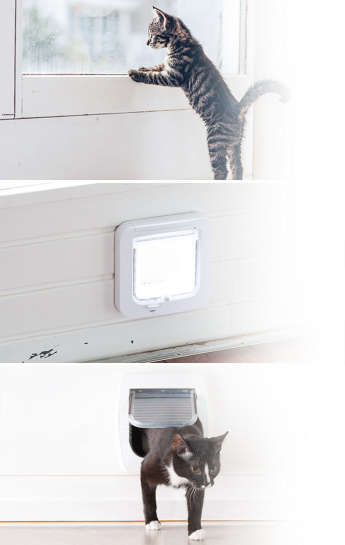 Having doubts that your brand new electronic cat door won't fit in your doorway? If you have double glazed glass units, the experts will have no other choice but to replace the whole thing. However, if you own the more common wooden doors, the cat flap fitters in London will use precise tools to neatly cut a hole with the dimensions of your new cat door. Also, we can install your new cat flap in any other door or window if the hole is already cut. We currently can not fit your cat flap in a glass door (incl. patio glass door), single or double glazed door or window unless you have already purchased the unit with a pre-cut hole in it. For more information about the various flap types, make sure to get in touch with our friendly customer advisers at a day and time of your preference. We recommend you to choose the most appropriate cat flap door for your furry friend and leave the installation to our experienced professionals. Get this service with a discount - You can get your cat flap fitting service with a discount. Also, if you end up using services for your property on a regular basis, then we would like to welcome you to the Fantastic Club. For £59 a year, you get up to 20% OFF discounts for our entire range of services as well as many other perks. It is the perfect subscription for landlords and people with multiple homes. And you can book a service for any property in the areas that we cover, there are no limits. Q: What should I do to have my cat flap fitted in a glass unit? A: For a single glass window, you need a circular hole in the glass. This job can be easily completed by your local glazier. However, a double glazed window or door require a new unit to be made with the hole cut. At this point, our cat flap fitters can help you with the installation process when this pre-work is already done. Q: In what type of doors you can fit my cat flap if I have the hole already cut? A: If you have some of these types of doors and the hole is already cut we can install your new cat flap in short order. If you have a wooden door we can cut it on the site and install your cat flap in no time! Q: What is the average time to have my cat flap fitted? A: The installation process may take around 1 hour when fitting the flap in a wood door. For a brick wall, the installation may take 2-4 hours, depending on the wall type - single or double brick wall. Q: What types of cat flaps can you install? Q: If I decide to remove my cat flap can my door be repaired? A: Unfortunately, your wooden door should be replaced but don't worry we can install your new door in a quick and professional manner. Q: Do you offer dog flap fitting? A: If you have already bought your new dog flap we can precisely cut a hole in your wooden door and complete the installation. Q: Why should I opt for Fantastic Handyman? A: A quick search online will reveal that many of our clients left positive feedback for our services. This is because the experts love their job and you can always count on them to provide your pet with a convenient doorway to your fascinating yard. Whether you need a high-tech microchip or magnetic cat door installation, the polite pros will fit any type with attention to detail.